Sometimes I love just sitting outside on the back porch enjoying the shade, the breeze and the smells of summer. Don't you love how some smells can transport you back in time to a place of innocence and adventure? Sitting on the back porch, around 10:30 a.m., the sun was high in the sky but there was a breeze blowing through the shady patio area. I could hear the leaves on the willow rustling, distant doggy sounds, a few birds, some bugs buzzing by, my Dobie running through the grass... And the smells. I'm not sure if it was the Mesquite trees behind my fence, but the smell reminded me of Mimosa trees and their shedded bean pods that used to fall to the ground in yards that I grew up around. I used those bean pods for my mud pie toppings, or would just peel them apart and play with the seeds, letting the dried out husks fall apart in my hands. 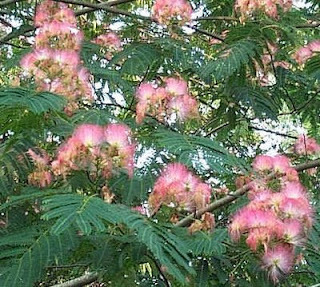 Did your grandparents or relatives have Mimosa trees? It seems that all the older folks had those in their yards. I refer to those trees as Retro Trees since they make me think of grandparents. I would really like to have one. I love the little pink and white fuzzy flowers. And those pods. What favorite yard memories do you have from childhood, and are there smells that transport you back to those days?